The sign up sheet for all grades of Night Pennant 2010 has been posted at the club. Members who would like to participate should add their name without delay (or call the Pros to ask them do so), as places are necessarily limited. Wayne Davies visits the RMTC, 11 November 2009. Me, CC, newbie & 4 juniors - in the presence of greatness. Australia’s first world champion, Wayne Davies, absent from the real tennis scene for many years, made a welcome return visit to Melbourne recently. He kindly gave two master classes – firstly to Chris Chapman and Mark Mathias, then secondly to 5 of our aspiring younger members: Ed Welch, Hamish Welch, Paul Rosedale, Daniel Williams, & Simon Carr. All the boys were inspired by Wayne’s uniquely enthusiastic approach to the game. Winners: Eric Wilkins, JPS, Charles Foster. Runners-Up: Brigitte Claney, Kim Dudson. 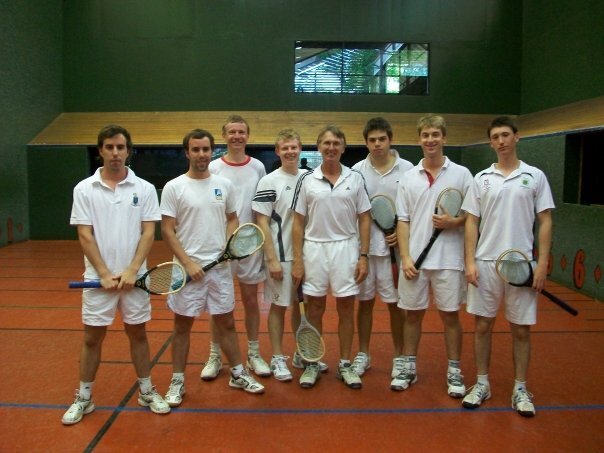 32 players spent Cup Day at the tennis club. We were pleased to include and welcome two visitors from the UK: Phil Beard (Lord’s) and Eric Wilkins (Jesmond Dene). RMTC members perhaps over-extended the hospitality to Eric, who ended up as part of the winning pair with Charles Foster. Eric and Charles played a very steady and determined game to defeat the highest handicapped pair of the day, Brigitte Claney & Kim Dudson, in the final. Despite the large odds given by the men, the result was never really in doubt – 6/2, in the end. The winners had previously scored an epic and highly meritorious win over Carr father & son, this time getting plenty of handicap, coming back from well behind to win 6/5. Kim & Brigitte had beaten Quentin Clark and Alice Wheeler in their semi-final, with the losers’ intensive recent preparation together in the end proving insufficient.